The Gophers men’s golf team continued their excellent play today at the NCAA Division I Championship in Virginia, moving to within a shot of tournament leader Stanford. Their 65-71-72-68-276 (-4) total was the second best team score of the day. Gopher standout Bronson LaCassie is leading the individual scoreboard by two strokes at -8 after shooting 67-65-132. Stanford and the Gophers are starting to pull away from the rest of the field, with third-place Coastal Carolina four strokes back. Director of Golf Steve Whillock reports that Oak Marsh Golf Club in Oakdale is adding another banquet room to their clubhouse. Demand for wedding receptions and meetings was pushing out the golfers, so construction is in progress to add more space. For more information, call 651-730-8886. The Minnesota Gophers men’s golf team teed off this morning at the 2007 Division I Men’s Golf Championship at the Golden Horseshoe Golf Club in Williamsburg, Virginia. Opened in 1963, the Robert Trent Jones Sr. Gold Course is playing as a 6,803 yard par 70 today (tour the course). GopherSports.com also reports that seniors Bronson La’Cassie and Niall Turner have been named to the PING All-Midwest Region team, as selected by the Golf Coaches Association of America. The Gophers are playing well early and are more than half-way through their round. We’ll update this post later today after the round is complete. Only two days left on the spring version of the The Wilds Golf Club Pay The Temp promotion. Green fees are based on the outside temperature a 1/2 hour prior to your tee time (with a maximum of $65 plus tax) and include cart. Over the holiday weekend, we caught two of the big blockbuster movies of 2007: Pirates of the Caribbean: At World’s End and Shrek the Third. We watched Pirates at the Muller Monster Screen at Lakeville 21 Theatre. At 80 feet wide and 35 feet tall with more than 30 Dolby Digital speakers, it’s the largest indoor screen in Minnesota. Bring your cash if you go, though, no checks or credit cards accepted (when was the last time you saw that?). As for Shrek the Third, my expectations were low, as most of the reviews hadn’t been very good. I wasn’t a big fan of the second Shrek (LOVED the first one), so I was very happy to find a franchise back on track. Eddie Murphy as Donkey was the highlight for me, but the story was also better than Shrek 2 and the characters were engaging. No need to stay to the end of the credits on this one, though. Movies I’m waiting for now: Harry Potter and the Order of the Phoenix (July 13), The Simpsons Movie (July 27) and The Bourne Ultimatum (August 3). Lost among the excitement of the Gophers heading to the Division I Championship this week was Saint John’s University winning it’s first ever NCAA Division III golf title on May 18th. The team’s 300-300-301-303-1204 (+52) total was twelve shots better than second place University of La Verne (California). The championship was played on two courses: the 7,047 yard, par 72 Prairie View Golf Club in Carmel, Indiana and the 7,069 yard, par 72 Hawthorns Golf and Country Club in Fishers, Indiana. More information can be found in the school’s press release. Our Saturday golf group visited Cannon Golf Club in Cannon Falls this weekend. I hadn’t been there for quite some time and found a lot of changes. The practice green seemed much larger and nicer than before. The new clubhouse is pictured above–the old one was burned to the ground (on purpose) and this one was built on the same spot. I was anxious to see it, as they don’t display it on their website. The interior is quite nice and I’ve heard the food is very good. The par-4 third hole is being moved to the top of the ridge (same green). The current par-3 11th and par-3 16th holes will be retired. The current par-4 17th will be turned into a dogleg left and become the new 15th hole. A new par-4 16th hole will run parallel to the new 3rd hole. A new par-3 17th hole will be added between the new 16th green and the current 18th tees. New tees for the 18th hole will be built. All of these changes are currently in the grow-in phase, which is happening while the old holes remain in play. The new holes are scheduled to open later this season. Last night my wife and I attended the Saint Paul Chamber Orchestra performance at the Ordway Center in downtown St. Paul. The concert featured violinist Joshua Bell, a favorite of ours. We were a little confused at first by the program, which was the last of their “Jazzed-Up” offerings for the season. After the intermission, you could choose between returning to the hall to hear Beethoven’s Trio in C Minor for Violin, Viola and Cello, Op. 9 No. 3 or stay in the lobby and listen to Chris Brown and Friends play Gershwin tunes from Porgy and Bess. The second piece was my favorite. Mr. Bell was front and center, standing for all three movements. A teenage girl and her mother were sitting next to me and I was fascinated to watch the young girl follow along with the sheet music. I overheard another woman ask them if she played and she said it was a piece she has been practicing, but that it’s so hard to play. She was truly excited to hear it played by a virtuoso on a priceless instrument. That excitement was contagious. After we figured out the Jazzed-Up options, we went into the lobby and listened to Chris Brown’s band. Prudence Johnson was the singer and we had fun listening while sampling some cheesecake. The lobby was full and my wife was tired of standing, so we decided to leave early. Recently there was a ranking of golf courses in the Twin City metro area by Jerry Zgoda in the Star Tribune. The rankings, as rankings do, raise questions as to what are the key elements of a great golf course? A great golf course has a wide variety of challenging golf holes and a harmonious rotation of par threes, fours and fives. Variety is the number one ingredient in a successful golf course layout. The way the golf course plays is dictated by the sequence of the golf holes. Back to back par threes, for example, play slowly and potentially put the brakes on the flow of your round of golf because of the way we are used to playing. Think of starting your round on a par three and then think about how much expectations and routine are part of our mindset when we start and play our round of golf. A golf course architect has hazards, topography and trees as the tools of the trade to establish the rub of the green on a given golf hole. Bunkers are the key feature used to establish the flow of the golf hole. Well-positioned bunkers define the most advantageous route to the green. On a good golf hole there is a strategic route that increases your likelihood for success. The topography needs to complement the hazards so that the risk of going directly at a hazard provides the reward that the hazard is guarding. If a hazard isn’t protecting or defining something then it shouldn’t be there. Trees should be incorporated strategically so that they play as three-dimensional bunkers. A key tree can block off the direct approach to a green for a drive that is not hit far enough in the fairway. 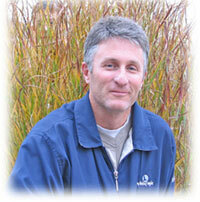 Don Ringstmeyer, manager of Castlewood Golf Course in Forest Lake, called in with a course update this week. The 3,043 yard, par 36 nine-hole course is under new management (since 11/1/2006) and has been cleaned up and rebuilt. Known as “The Rock,” the course also incorporates a 1,503 yard junior course, known as “The Little Rock.” Junior leagues for kids aged 9-17 will start when school is out and include a girls league on Wednesdays and a boys league on Fridays. One Saturday each month will be “Big Buck Saturday,” with the person closest to the pin on their 212 yard par 3 winning a hundred dollar bill. Entry is free to all players. The first Big Buck Saturday will be June 16. For more information on Castlewood, call 651-464-6233. The action is heating up in Minnesota high school golf as we head towards the state championships, to be held June 5-6 at Bunker Hills (Class AA) and June 6-7 at Izatys (Class A). Regionals are being held this week all over the state–for more information on regional results, visit the MGA’s Hot News section to read the excellent coverage by Mike Fermoyle. Golfing in Minnesota will be on hand at both Bunker Hills and Izatys with coverage of both boys and girls events. Cindy Early, Special Events Officer for the United Hospital Foundation, reports there are only a limited number of spots left for the 2007 United Hospital Golf Classic, to be held July 30 at White Bear Yacht Club. The $300 entry fee includes a golf clinic, guest gift bag, luncheon, 18 holes of golf and an awards reception following golf. Proceeds benefit the Peter J. King Family Practice Health Center, which will house the United Family Practice Health Clinic. For more information, visit the event web site or contact Cindy Early at 651-241-8027. Almost everything seems to be doing well this spring. These are some new flowers my wife planted–I’m not sure what the blue ones are, but bleeding hearts have always been one of my favorites. The new spruce in the front yard suffered a little stress from the planting, but I think it’s getting better. The lilacs bloomed and have grown into monsters (even after trimming last fall). Same for the maple bush outside my home office window and the sugar maple tree in the backyard. One last project to do this summer and the plan will be complete (aside from that expensive retaining wall, which may have to wait until the next owner). Amateur registration for this year’s Tapemark Charity Pro-Am is almost full. If you’d like to play, visit their website or call tournament CEO Phil Callen at 651-552-5639 right away. The multi-day event will be held June 8-10 at Southview Country Club in West Saint Paul. One of the “Minnesota Majors,” the Tapemark is a unique opportunity to play with a pro, raise millions of dollars for charity and be a part of Minnesota golf history. The entry fee for the 2007 event is $750, which includes two rounds of golf (three if your team makes the cut), a drawing night buffet dinner, tournament merchandise and a buffet dinner for each contestant and a guest on Saturday, June 9. Robert Klas, Jr., president of Grand Slam sponsor TAPEMARK Company, was featured this month in a Saint Paul Illustrated magazine cover story. Nice hat, Bob! My oldest daughter had her bridging ceremony yesterday and moved from Brownies to Junior Girl Scouts. Congratulations to Troop 372! Pictures from the big event have been uploaded to the private section of the photo gallery. If you have trouble viewing new albums in the gallery, make sure to clear your browser’s cache–the Gallery 2 software I use seems to have weird issues with that. We offer a FREE Round of Golf for signing up within our email database. In addition, registered members receive exclusive discounts on food, bowling and other golf specials. UPDATE: Sundance has just launched an updated website (same address). Also, their main bar/lounge is now officially titled “FRITZY’s Sports Bar & Grill,” after Brian Allen’s father. Our regular weekend golf group visited The Summit Golf Club in Cannon Falls yesterday morning. I visited with course manager Jack Baker, who reported that they will be announcing new wine tasting events with a local winery soon (perhaps this one?). Selected by Golf Digest as one of 2002’s “Best New Affordable Public Courses,” The Summit has been one of my favorite courses in the south metro for several reasons: all bentgrass layout, dramatic elevation changes on the back nine, general lack of crowds (even on weekends) and overall good value. The owners continue to reinvest money in the course, adding paved cart paths, upgraded parking lot and clubhouse deck over the past few years. Word seems to be getting out, as there were quite a few people there when we arrived. Due to a scheduling glitch with Teemaster, we went off the back side first to avoid a multi-person group starting on one. We’ve never seen the course perform maintenance on Saturdays, so the patches of long rough can be forgiven. We were concerned, however, about the dryness of tees and fairways. Perhaps they were hoping the forecasted rain would arrive, but without more water, those areas are in danger of serious damage. As I was playing the course, I realized I didn’t know who designed the course. The scorecard doesn’t say, but the course’s website lists Midwest Golf Management, while Golf Digest lists William Whitworth, Marty Benson Jr. and Greg Wencl. I’ll do more research on that as we prepare a series on prominent Minnesota course architects. Today’s third and final round at the NCAA Central Regional was a tough one for the Gopher men’s golf team. Clayton Rask shot nine strokes higher than his Friday round of 69, while Ben Pisani dropped from a tie for 35th to a tie for 93rd after shooting a fourteen-over-par 86. But the team won a playoff against Texas A&M on the first playoff hole to advance to the NCAA Championship beginning May 30 in Virginia. Yesterday I had the privilege of joining course co-architect Paul Miller, course superintendent Greg Nolan and his assistant Jeff for an afternoon round at the Meadows at Mystic Lake course in Prior Lake. The course was in great shape, but the wind was really blowing. Several grassland areas around the course had been burned with a controlled burn a few weeks ago, making wayward shots easier to find. Other areas were filling in nicely with fescues and wildflowers. The “Spin-and-Play” promotion runs through June 1. Spin the wheel in the pro shop to determine your green fee (maximum of $65, minimum free). Demo Day will be held Saturday, June 2, from 10am – 1pm on the driving range. Scheduled brands include Callaway, TaylorMade, Nike, Ping and Cleveland. The Minnesota Gophers men’s golf team moved from a tie for 11th place to 6th place today at Rich Harvest Farms in Sugar Grove, Illinois. 2007 Minnesota Golf Champions winner Clayton Rask bounced back from an opening day 84 with a three under par 69 (two off the low round of the day). Minnesota’s two day total 314-290-604 (+28) is 19 shots behind region leader Tulsa. The Gopher men’s golf team is in Illinois this week to play in the NCAA Central Regional at Rich Harvest Farms Gold/Silver course (par 72 – 7,214 yards). After the first day of competition, the Gophers are tied for 11th at 314 (+26). The top 10 teams advance to the Championship, to be held May 30 – June 2 at Golden Horseshoe Golf Club Gold Course in Williamsburg, Virginia. Group discounts are also available at the 2,996 yard, nine-hole course. For more information, call the club at 218-935-5188. Prairie View Golf Links, located 1-1/2 miles north of Worthington in southwestern Minnesota, reports that it’s been a little windy on the plains the past few days. Course manager Bryce Negrete says that they’ve had 40-mph winds, making the links style course very challenging. There are no trees and no houses on the 6300 yard, par 71 course, which was designed by Worthington-native Joel Goldstrand. Bryce says their full weekend walking rates this year are $12 for 9 holes and $18 for 18 holes, but they offer a special on Mondays and Thursdays: unlimited golf with cart for $30 (singles) or $20 per person if you bring a friend. Last week, my co-worker and I thought about sneaking out of the office to play a quick nine holes. Apparently the downturn in the golf industry wasn’t in effect that day, as we had trouble finding an open spot. First, we stopped at Cedarholm in Roseville. A women’s league was in full-swing, so we headed to the U of M Les Bolstad course. For some unknown reason, the course was closed and their range was packed with people. Finally, we headed to Francis Gross Golf Course in Minneapolis. Lots of people were going off the first tee and a few were making the turn. The pro shop said we could get out in about an hour, but we couldn’t wait that long to start. We gave up and decided to just hit balls on their range. That would have been OK, except for two things: the range was irons-only with mats and not a single additional group went off the back nine the entire time we were on the range. Doh! 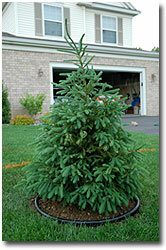 Yesterday I finished off this year’s Mother’s Day project–a new Black Hills Spruce for the front yard. This was the last major plant purchase I had left from our five-year landscaping plan. I still have some additional lilacs to plant in the back yard, but they are relatively cheap compared to trees. I bought this one from my favorite local garden center, Lilydale Garden Center. We’ve purchased almost all of our landscaping items there and have been very happy with the quality and service. If you need something, go there and ask for Dave. The non-plant item that remains is a multi-tier retaining wall for the east side of the house. I’d love to have that done, but the quote five years ago was around $5,000. For Father’s Day, I may order the other lilacs and do some repair work to the area I want them to go (which may also involve a small retaining wall to level off that part of the yard). Hopefully my arms will recover by then–digging is hard! Last Saturday, my daughters and I went to a free golf clinic hosted by Goldy Gopher at the U of M golf course. Free pizza, drinks, posters and one-on-one lessons made for a fun time by all. Gopher Clayton Rask won his second Minnesota Golf Champions tournament today at Minneapolis Golf Club, shooting 71-70-70-211 (-5) over the three day tournament. 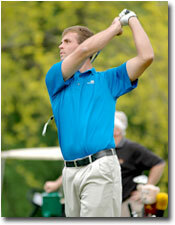 Rask, a junior on Gopher men’s team, won the 2005 event with a 71-73-65-209 total. Full results can be found on the Minnesota Section PGA website. Yesterday was Golf with Goldy day, held at the University of Minnesota Les Bolstad Driving Range by the men’s and women’s Gopher golf teams. Our friends Brad James, Andrew Tank and Dee Forsberg-Voss helped organized a great, free event for kids. Free pizza, drinks and posters, a clinic with demonstrations by current Gopher players and personalized instruction on the driving range made for a wonderful afternoon (the perfect weather didn’t hurt either). Thanks to all who volunteered their time to be there. Make sure to check out the summer clinics and instruction options offered by Brad, Andrew and Dee through the Brad James Golf Academy and the Golf Institute at the University of Minnesota. The 2007 invitational Minnesota Golf Champions tournament is being held today through Sunday at Minneapolis Golf Club in St. Louis Park. Jeff Sorenson of Columbia Learning Center is back to defend his title. The public is welcome to come and watch some of Minnesota’s best pros and ams compete. For more information, please visit the Minnesota Section PGA website. Today I paid a visit to Bent Creek Golf Club in Eden Prairie, home of head pro and Minnesota Section PGA secretary Paul Kelly. 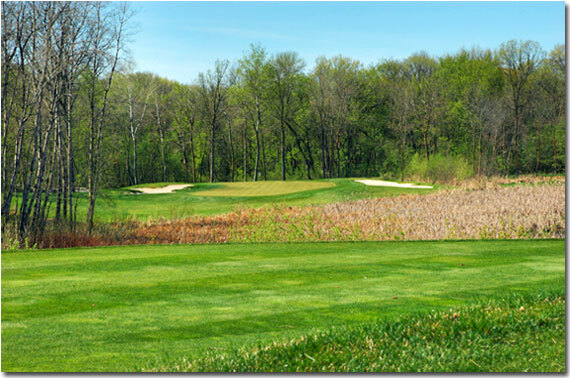 Bent Creek is a par-71 private course that opened in 1958 and was designed by Don Herfort. PK was kind enough to let me have a cart to drive around and take photos (watch the Photo Gallery for uploads soon). There has been some uncertainty about Bent Creek that was recently clarified by the Eden Prairie city council. According to this page, the council passed an interim ordinance temporarily prohibiting areas of new development on courses for 12 months. Bent Creek was privately owned by two people and one of them passed away. The remaining owner wanted to sell to developers, but this action by the city effectively blocks any non-golf development. The course itself was in great condition and offers a lot of elevation change on the front nine. The back side is flatter, but has a lot of water. The tips play to 6,514 yards with a rating of 72.4 and a slope of 136. For information on membership, call the Bent Creek office at 952-937-0789. It has been a very stressful few weeks at work for me–way too many projects going on all at the same time. I like being busy and juggling things, but the 14 hour days are starting to wear on me a little. If the big dollars were rolling in, that would make me feel a little better, but as it is now, it just means I’m working for less money per hour now than I did in college. I still enjoy it overall, though, so I’ll keep plugging away and hopefully the big payday will come eventually. Los Angeles School. We signed a contract to help manage a charter school in the Los Angeles area beginning this fall. This project will involve travel, technology planning, training, purchasing, installation, security, remote access, network management, video conferencing and web development. All with a limited budget, too. I am excited by this one, but it carries a moderately high level of risk. Golfing in Minnesota Website. The first of a planned nine Minnesota Publishing Company websites, Golfing in Minnesota is in full swing (pardon the pun). The framework is in place and now I’m adding data and news on a daily basis. It’s great to be back in the golf business again, but the amount of information we are dispersing is staggering. The tees above are part of our new promotional campaign. Andrew Tank Golf. The assistant men’s golf coach at the University of Minnesota has hired us to do a personal website, following on the heels of the sites for head coach Brad James and the Golf Institute. The creators of the Minneapolis production of Bush is Bad – The Musical have hired us to do a show site similar to the one from the New York production. The HSRA/Studio 4 network of websites need some significant work done this summer to strengthen our branding, prepare for the LA school (and a potential 2008-09 New York school), raise funding for capital projects and roll out the new version of our student information management system, Project Excellence. Technology plans (and wish lists) for HSRA and the LA school need to be updated for 2007-08. The 2007 Tapemark Charity Pro-Am golf tournament at Southview Country Club in West Saint Paul is rapidly approaching (June 8-10). This will be immediately followed by Apple’s Worldwide Developers Conference in San Francisco. A new charter school in St. Paul wants us to write a tech support proposal for them that would start this fall. Those are just the things off the top of my head–there are many others in our project tracking system. Last night I attended the University of Minnesota Alumni Association’s annual gala, held on campus at Mariucci Arena. 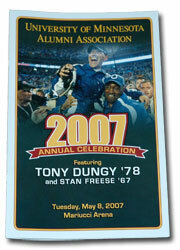 The speakers were Stan Freese ’67 and Tony Dungy ’78. While Mr. Freese has had a distinguished musical career with Disney, most of the people were there to hear the coach. While some of his past comments have caused controversy, last night’s talk was completely free of anything remotely controversial (almost to the point of being boring). There were some protesters outside beforehand, but there turned out to be little to protest in his public speech. I am an alumni of the University, but I’m not currently a member of the alumni association. That mostly has to do with my belief that I shouldn’t have to donate money to the school until my mountains of student loans are paid off. I felt a little bit of school pride at the event, but mostly it just seemed hokey–like some bizarre club that makes you feel awkward for being a member. Good to see Greg writing golf stories again. Here is his other gig: F.A.C.T’s Report. Purchase before May 19 and get one free round of golf. For more information, call 218-663-7195 or toll-free at 888-564-6543. About a week ago, my oldest child received a mailing from the Minnesota Wild Kids Club. One sheet was an ad for an upcoming ice show, while the other had a trivia contest promising prizes for the first 50 kids to respond with the correct answers. We went through the ten questions right away (with the help of wild.com) and mailed it in the next day. Today a package arrived with an autographed copy of the 2006-07 Wild Yearbook! We hadn’t purchased one of those this year, so it was a double treat. Brent Burns and Manny Fernandez hand-signed the cover…too cool! GopherSports.com reports that the Gopher men’s golf team has been seeded 11th (out of 27 teams) in the central region of the NCAA golf championship. They will play May 17-19 at Rich Harvest Farms golf course in Sugar Grove, Illinois, site of the 2009 Solheim Cup. Other Big Ten teams competing in the central regional include Michigan State (10 seed), Northwestern (13), Wisconsin (15) and Purdue (16). Penn State will play in the east regional at The Golf Club of Georgia in Alpharetta, Georgia. While visiting Faribault Golf Club last weekend, I picked up a complimentary copy of the April 2007 edition of Executive Golfer magazine. Published by Pazdur Publishing, Inc., this edition contained several stories and a large national directory of private courses, including Minnesota clubs. Executive Golfer is a national magazine, published bimonthly and exclusively for America’s private club members. Its readers are wealthy and cultivated. Executive Golfer delivers heads of household with higher incomes than Fortune, Forbes, Business Week, The Wall Street Journal, and Barron’s. Executive Golfer is a niche publication. Its purpose is to deliver America’s richest executive golfers. Consequently, Executive Golfer’s private controlled circulation of over 100,000 is rigidly restricted to over 3,500 of America’s finest private country clubs. It is not available on the newsstand. 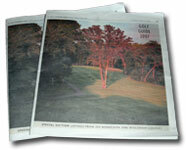 The 2007 edition of the Pioneer Press Golf Guide was included in the Sunday paper on April 29th (I’m still waiting for confirmation on the publication date of the Star Tribune guide). This year’s 20-page edition has a Peter Wong photo from Willinger’s on the cover (the par four twelfth) and the usual course guide information and ads. No other stories this year, however. The Pioneer Press golf writer, Tad Reeve, is still with paper and we hope to see more of his excellent writing soon. Once we hear back from the Star Tribune, we will report on their guide as well. Duluth City Courses to Privatize? Chris Hamilton at the Duluth News Tribune wrote a story about the Duluth city courses possibly going private as a response to issues with the AFSCME union. Also in the Duluth News Tribune, a story written by Andy Greder about the current state of northland courses and how the shrinking number of golfers is impacting the business and the region. Free registration may be required to read both stories. That tall tree on the left could survive thunderstorms and lightning, but couldn’t take the windstorm we had here last night. It snapped right off and thankfully fell away from the yard and into the wetland area. Today we braved the clouds, wind and constant threat of rain to play 18 holes at Faribault Golf Club. They have a very nice web special–click here to sign up for their mailing list and receive a coupon good for a buy one, get one free coupon they send to you via email. There appear to be no restrictions on this offer, so our Saturday morning round cost $16 per person (walking). The Willie Kidd/Bob Carlson layout has a lot of repetition, but for $16, who can complain? Just like last year, I went to see Hanz Erik and the Hims last night at the Fine Line Music Cafe in Minneapolis. Unfortunately, this is likely the last time I get to see them there, as lead singer Hans Erickson is moving to New York City in August (no word on future plans for Stein Malvey and Erik Naslund or either drummer). I missed the start of the 11pm set by a few minutes (when has an act ever started on time? ), but the rest of the one hour set was very enjoyable. A Hollies cover, two new songs, some old HanzSolo tracks and most of my favorite songs from Copay (including the wonderful Potential Energy as a closer) made for an entertaining, but short, evening. The downtown Minneapolis nightclub scene was very vibrant last night. I know I’m getting old, but that’s just not my thing any longer (not that it ever was, really). Fun to see all the energy, though. The spring 2007 edition of RangeView, the Iron Range Resources Board magazine, has a story on the clubhouse at The Quarry at Giants Ridge. Originally opened in 2003, both the clubhouse and the Wacootah Grille will be expanded this spring. The new facility will be twice the size of the old one and will feature a new full service bar. A large patio deck will hold 150 people for special events and tournaments. Watch for photos of the new building next month on Golfing in Minnesota. It hasn’t been a great start to spring on the lawn front. First, we had a warm weather streak when I turned on the outside water before the sprinkler system had been activated. When I was out of town, it got cold again and the outside pipe that feeds the sprinklers froze. Turns out it split the pipe, so the sprinkler company had to cut out that part and replace it when they came to turn on the system for the year (see above, left). They didn’t charge much extra to fix it, so I was happy. The first time the system came on at 2am, the pipes in the basement started humming loudly–it sounded like the civil defense sirens were going off. I couldn’t figure out the source of the hum and it seemed to be coming from everywhere. The sprinkler company was in the neighborhood a week later for a neighbor’s system, so I asked them to look at it. He couldn’t find the problem and suggested I call a plumber. Not wanting to spend the money for that, I monkeyed with it for about two weeks without success. Earlier this week, though, my brother-in-law stopped by to take a look. He is a true Mr. Fixit and took all of about five minutes to resolve the issue. I wasn’t here to see it, but I guess he turned on the sprinkler system, hit one of the inside pipes a few times with his hand and the humming stopped. I ran the system this morning for the first time since then and it’s blissfully silent now. Thanks Dan! The other problem was my old lawn mower. I had purchased it for $50 a few years ago from my previous neighbor when he moved to New York and got a lot of use out of it. Last fall, however, it make a “chunk” noise while I mowing the side hill and shut down. I couldn’t manually get the blade to move, let alone re-start. I used a neighbor’s mower for the rest of the season and put the broken one in the corner of the garage. Two weeks ago, my wife dropped it off at the local hardware store to have it checked out. They called me last weekend and said it wasn’t repairable. I looked at the Consumer Reports lawnmower reviews for their best value award and bought the Toro pictured above (right). It was the cheapest one they had, but it was the exact one I was looking for based on the CR recommendations. I liked buying from the local store too and was happy to see that the same model at Home Depot was the same price (and out of stock). Time for some lawn work! Just added to our charity events page–the Minnesota State Open Pro-Am Golf Tournament, to be held July 26, 2007 at Bunker Hills Executive Course. One Special Olympics Minnesota athlete will pair with a Minnesota PGA pro and two sponsors and golf nine holes at Bunker Hills executive course, with luncheon included. Cost is $500 per twosome, with proceeds benefiting Special Olympics Minnesota. For more information, please contact Christine Nelson at 612-604-1259 or via email at nelsonc@somn.org. Today was the last day of the spring special at Legends Club in Prior Lake. $48 with cart was too good of a deal to pass up to play this award-winning course. They had just top-dressed the greens, but they rolled smooth and the rest of the course was in good shape. We played from the 6000-yard white tees, which I had never played before. Much different course from closer up, eh? The food we had for lunch after the round was spectacular and I highly recommend the gourmet macaroni and cheese with caesar salad. Calling it macaroni and cheese is deceiving: shell pasta in a three-cheese sauce, breaded crust topping and prosciutto ham is not exactly the Kraft version.